This pomade was my first and a total revelation. We could say; an eye opener to a different league of hair fixative. 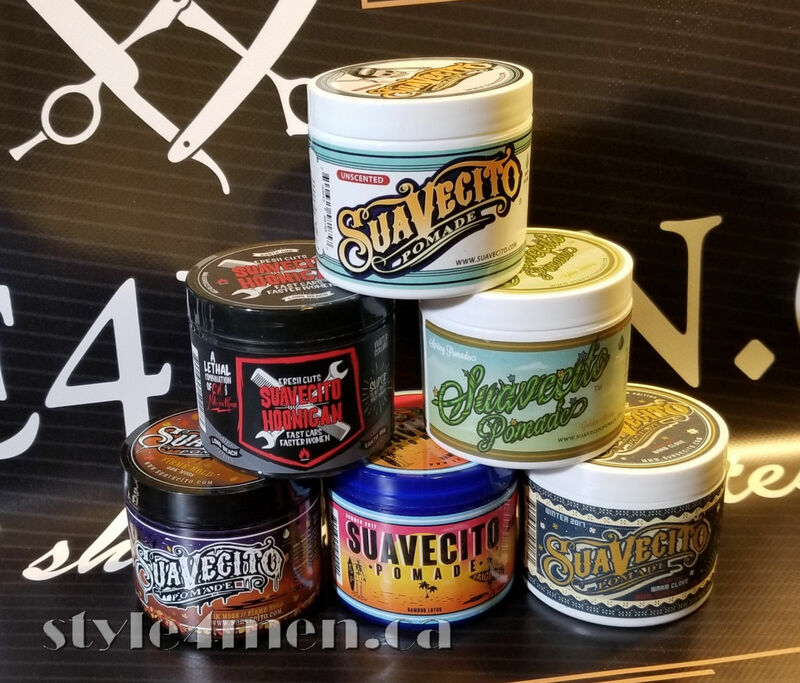 About 2 year ago my hairdresser’s salon Hair Junkie started carrying the Suavecito brand and knowing my hair style, it was presented to me to try. Well, let’s just say that it was the beginning of a new passion. The Suavecito branding is unmistakable with the greaser skeleton. It certainly targets its clientele. The pomade itself is a nice gold color for the regular hold and a shade darker for the strong hold. It’s scent is also memorable. Perhaps a bit hard to narrow down, but to me it smelted like: Coca Cola or maybe even caramel. Definitely sweet. Whatever it is, I certainly liked it right away – but we will come back to the fragrance later on. The texture of the pomade is somewhere between a wax and jello. Closer to a hard jello that needs some softening before application. It takes very little of the pomade to get your hair into the desired style. In that sense, it also makes for a jar that will be long lasting. On the aspect of cost-benefit, it is generally speaking a very reasonably priced pomade. When my salon was offering it, it was $12. A fabulous deal, when considering the quality of the product. There are other lesser pomades selling for much more. The hold, is absolutely top notch. In fact, it is the best I have tried. The skeleton dude with the pompadour on the label is no exaggeration. If you want to go that high, you can. The product dries well and is firm as opposed to crunchy. But consider your hair to be locked in place for the duration. Above, we mention the “Strong Hold” version, that product is stronger than what I needed and I would direct most guys to the “regular” edition as it offers the strongest hold in the pomades I have tried. Washing it out was a breeze. Rinsing and washing with any regular shampoo does the trick. Two years ago when I first tried this pomade, Suavecito also had a very cool Rockabilly inspired site which conveyed a whole corresponding life-style. I encourage you to check out their site as they offer a wider range of products. I don’t usually put as rating for scent, since that is a totally personal component. At best, I want to give you an indication of what to expect. I rate it here because as much as I enjoyed its “Soda Pop” fragrance, it also turned out to be an issue for my wife as the fragrance was too strong. Since this is the lady I want to get close to, we will all agree that turning her off is not the best course of action. 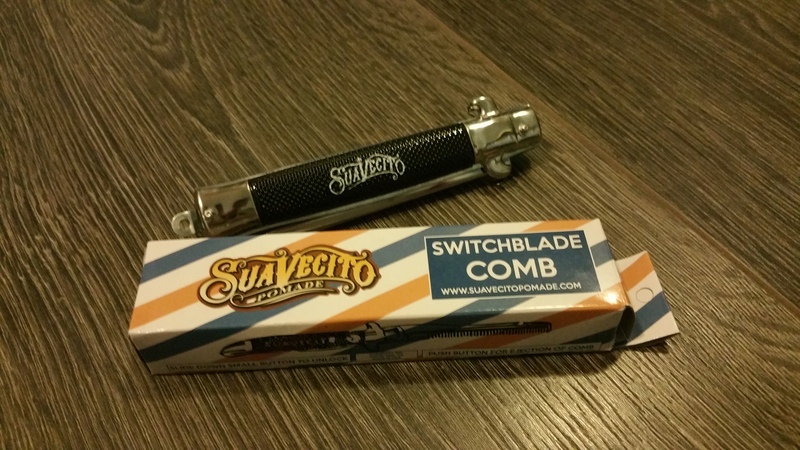 Two years ago, the range of products offered by Suavecito was also smaller. They now have a number of special seasonal pomades. I will certainly try more of their products and give you my feedback. 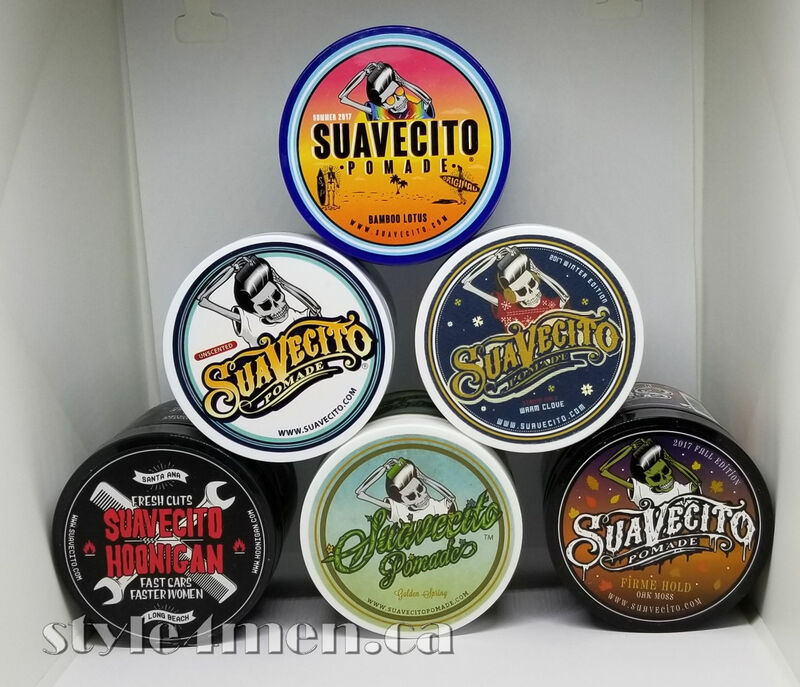 Note that Suavecito also made a shaving cream, which you can read about in the shaving section. 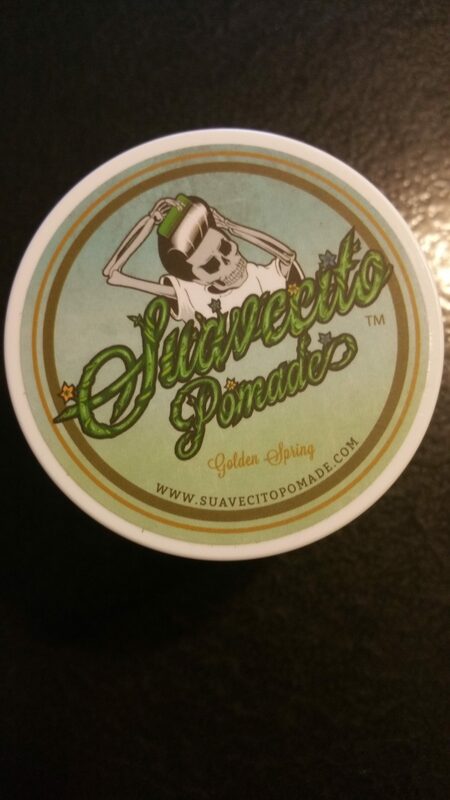 As mentioned above, Suavecito makes a number special edition pomades. During my last trip to Toronto I was able to pick a jar of the “Golden Spring” edition. Up front, you are getting the usual level of quality. This is not a new formulation. The differences are essentially in the scent and the colour of the product. Maybe to some folks that might be a deceiving marketing approach. To me, it was a “golden” opportunity to get a new twist on a product I already enjoyed very much. 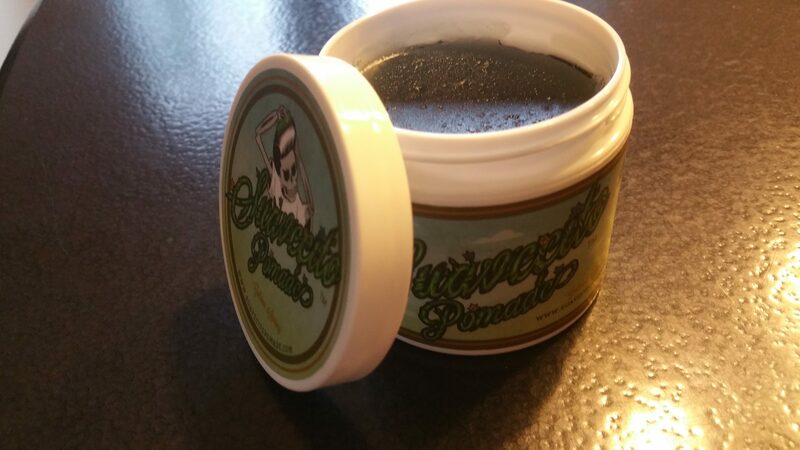 The pomade offers its usual consistency, firm and jello’ish. The pomade is green. Don’t let this alarm you. Your hair will not turn green by putting this stuff in. The scent is more musky and fresh than the original iteration. I found it pleasant and refreshing as did my wife. That means I can add this pomade back into my arsenal. For the rest (hold, shine, etc…), it was just its usual perfect self. I just got a promo email from Suavecito advertising their “summer” iteration. 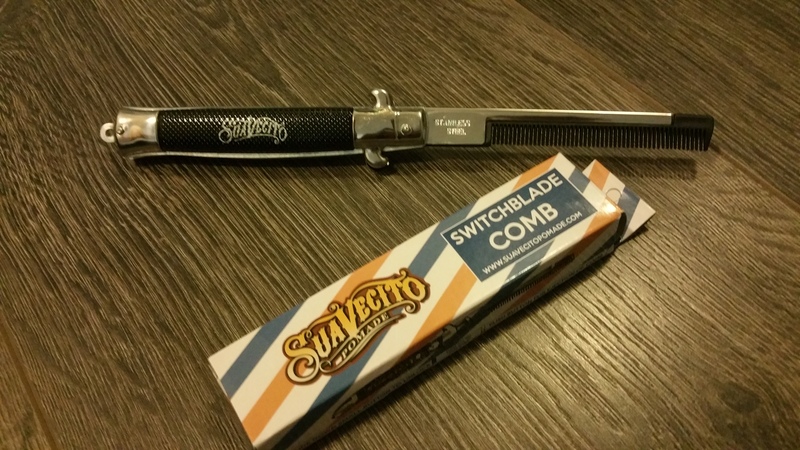 Suavecito also offers the above amusing switchblade comb. A few weeks back I ordered a couple. One for myself and another for my son who is clearly having a blast with this “Greaser’s” comb. As a comb, its “okay”. Obviously, it’s meant more as a novelty. The construction is a basic stamped foil and it is very light. It will serve well to surprise people here and there, but I don’t expect it to survive years and years. If you are leaning towards getting one, shop around. Don’t pay too much for it. In an unrelated manner, I was looking up what “Suavecito” meant in Spanish. Amusingly, it mean “Softly”. It now actually makes the branding even more fun as it’s total sarcasm considering the skull dude logo and the underground image.